The Bush National Guard Story Lives! Joe Hagan has a long story in the current issue of the Texas Monthly about George Bush’s adventures in the Texas Air National Guard, and as a longtime Bush National Guard junkie I was eager to read it. As it turns out, it doesn’t really break a lot of new ground, but it’s got a few new tidbits here and there and overall it’s a pretty good take on the whole affair. It’s worth a read. once put it. And because of Bush’s stonewalling on the issue, the power of the unanswered questions about this period of his life would take on a life of their own. That’s pretty much what I took away from the story too in February 2004: “Bush cut a few corners and was less than zealous about finishing his 6-year commitment. Given Bush’s age, the tenor of the times, and the winding down of the Vietnam War, this is hardly noteworthy.” In a nutshell, Bush pulled strings to get into the Guard and, in one way or another, messed up during his fourth year and pretty much disappeared. 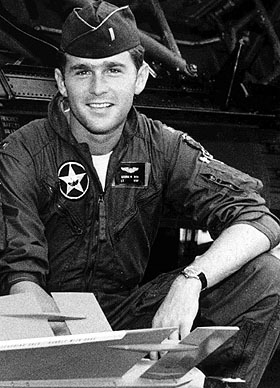 Nothing happened to him, though, because Vietnam was winding down, no one really cared that much about a superfluous pilot, and nobody wanted to make trouble for the son of a Republican Party bigshot anyway. It’s hardly a laudable story, but frankly, it was never all that contemptible either. It was only a big deal because Bush eventually ran for office himself and felt like he had to cover up the failings of his youth. Over several days of questioning, Burkett told Mapes he’d gotten the documents from a former Guard colleague named George Conn, who had previously vouched for Burkett’s credibility in press reports. But Mapes never found Conn to corroborate the story. This has always struck as one of the least believable parts of the story. By 2004 Mapes had been running down these allegations for more than four years, and in all that time she said she had never been able to connect with Conn. But I talked to Conn. I got his number from a friend, called him in Germany, and we chatted for about 20 minutes. He wasn’t willing to say very much, but I had no trouble finding him. Several other reporters talked to him too. So is it really plausible that after four years of digging Mapes didn’t manage to talk to him? I’ve always wondered. Especially considering that, for various reasons, Conn was probably about the least likely source imaginable for these documents, and it would have set off ear-splitting alarm bells if anyone had known he was supposedly the source. This is eye watering. It’s not a question of whether any typewriter in the world could have produced the Killian documents, it’s a question of whether the typewriters at the National Guard base in Austin could have produced them. And we know they couldn’t have because Killian’s secretary, Marian Carr Knox, has told us which typewriters she used in Killian’s office in 1972: an Olympia and a Selectric. And neither one of those typewriters could possibly have produced those memos. There are a whole bunch of other reasons to be quite sure that the memos are fakes, not the least of which is Bill Burkett’s preposterous story about how he came by them, which he offered up after he’d been forced to admit that he lied about getting them from George Conn. But no matter where they came from, the key question has always been why anyone would have held onto them in the first place. Why would Jerry Killian have kept them? And even if he did, why would someone have cleaned out Killian’s files when he died in 1984 but saved just those six documents? At the time, George W. Bush was a nobody. It simply makes no sense that someone would have taken those six files, and only those six files, and then would have held onto them for 20 years without ever showing them to anyone. There’s a lot of other evidence that the documents are forgeries beyond just their dubious provenance, and I’ve long believed that Bill Burkett was pretty obviously the source. One of the enduring mysteries about the memos is why a forger would create documents that look for all the world as if they were created in Microsoft Word with all the default settings intact. You’d have to be a helluva technical bonehead to do that! But as it turns out, that describes Burkett pretty well. I talked to Burkett for a couple of hours back when I was reporting this story, and toward the end of our conversation Burkett got sidetracked into an odd rant about PCs and technology that he was having trouble with. It was obvious that he simply knew nothing about computers or typewriters or pretty much anything related to them. In other words, he’s exactly the kind of person who (a) knew enough about the Bush record to invent memos that sounded right, (b) lacked just enough Air Force background (he was Army National Guard) to screw up the lingo a bit, and (c) was ignorant enough of technology not to realize that a document created in Word looks nothing like a document created on a typewriter in 1972. Nobody will ever be able to prove that Burkett forged those memos unless he fesses up someday, but he sure seems like the prime candidate. In any case, there’s a mountain of evidence that the Killian memos are fake, and it’s sad to see Dan Rather tell Hagan, “I believed at the time that the documents were genuine and I’ve never ceased believing that they are genuine.” That’s just delusional.